Vidal and Sohn was founded in 1883 to provide fire-fighting services to the harbor where coal was the big mover. 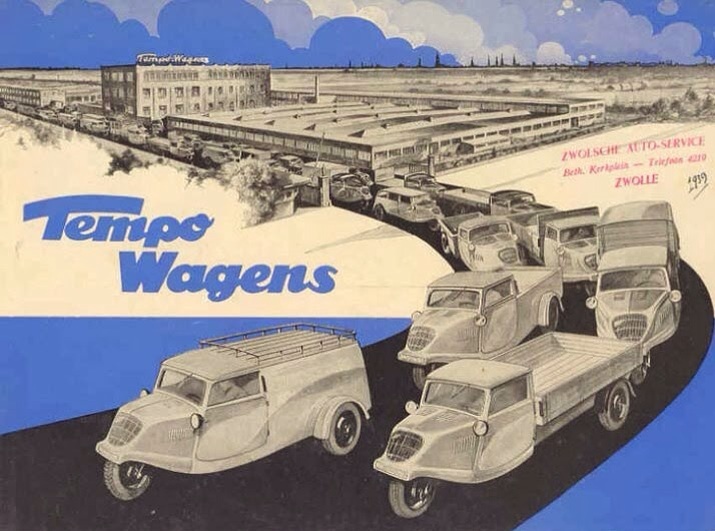 Following the decline of the coal industry they established Tempo-Werke in Hamburg in the early 1920s where they concentrated on light commercial vehicles such as delivery vans. The first vehicles were the Tempo T1 and T2, which were both "Tricycle" vehicles. They had a single wheel in the rear, and two at the front, similar to the then popular Goliath utility vehicles. Both models were powered by single cylinder engines of 200cc and 400cc respectively. I love this picture of an airborne Hanseat. I hope the rear axle stayed attached upon landing ! The economic crash of 1929 left Tempo struggling mightily to survive, but the same crash put major competitor Rollfix into bankruptcy. Their chief designer Otto Daus jumped to Tempo, and completely redesigned the vehicles to produce the T6. Although similar in appearance, the new model was a quantum leap forward in quality and reliability. They now used two-stroke JLO engines, and the configuration changed to a single front wheel with two at the rear, giving birth to the model name Hanseat. Goliath was now the main competitor, and a series of "leapfrog" improvements (and experiments) ensued. Different steering mechanisms, fully enclosed cabs, front wheel drive, larger more powerful engines, etc. They also produced a variety of body configurations, including a passenger sedan (the first SUV? ), a flatbed, a panel van, etc. In the battle for carrying capacity, Tempo also produced its first four-wheeled vehicle. Named the V600, it boasted a carrying capacity of 1000 kilos. It was also front wheel drive with independent axles. Not long after, in response to an army contract, they produced a four wheel drive light utility vehicle powered by two 600cc Ilo engines (one front and one rear). This vehicle had good ground clearance, good speed (70 KPH), and was efficient due to good fuel mileage and the ability to shut off one of the engines (the first 4WD SUV?). The German military rejected the use of a two-stroke engine, but Tempo went into production anyway, and almost all of the G1200s were exported. In 1934, Tempo took a Hanseat to the Avus high speed track and set a number of world records including the endurance record for trucks under 200cc. Post WWII, Tempo survived by repairing vehicles used to clear and rebuild. Eventually, they began to produce Tricycle based machines again. Then another momentous event took place when Otto Daus retired, and new designer Bergst decided to modernize the fleet. Tempo launched the four-wheeled Matador which had a Volkswagen engine and gearbox beneathe the cab-forward design. It proved very popular until Volkswagen stopped supplying engines in 1952 in order to launch its own utility vehicle. Replacement engines were tried from Ilo and Henkel, but with very poor results, and by the mid 1950s, Tempo was in trouble. In order to survive, Oscar Vidal sold a 50% stake to Hanomag, which allowed them to make needed capital investments. They struggled along until 1956, when they were forced to stop manufacturing the Hanseat, and the design and rights were sold to the Indian company Bajaj. The Bajaj-Hanseat was very successful in its new markets. Once again, a fortunate turn of events allowed Tempo to finally get a good motor from Austin in England in 1957. This revived the Matador, and sales began to rise once again. They were sold in the UK as the Jensen-Tempo, and were sold in Australia and many other markets. There were several updates and some restyling throughout the late 1950s and the 1960s, includng optional Hanomag diesel engnes. In 1969, Mercedes purchased Hanomag, and they soon consolidated all labels, including Hanomag and Tempo, into the Mercedes brand. The Bajaj-Hanseat was produced without much alteration until 2000.